Who is the Monster ? On th e front cover, I can see the head of the creature. Its head is ugly and terrifying. He has big yellow eyes. In the top left-hand corner, I can see the hand of the creature that is holding Billy’s head. In the middle, I can see the title of the book in green letters: Frankenstein 2.0. In the bottom left-hand corner, I can read the name of the author. The story takes place at the top of the Mont Blanc during the XXIst century. Victor Frankenstein is Frankenstein Senior’s son. He is the main character and he is the creator of the monster. The creature was created by Victor Frankenstein. He is violent and ugly. Frankenstein Senior is Victor’s father. He is a brilliant scientist and he has his institute where he preserves the bodies of dead people by freezing them. Victor’s mother is dead at the beginning of the story because of the sun. Elizabeth is Victor’s friend. She lived with Victor’s family and she loves Victor. Billy is Victor’s little brother. He will be killed by the creature. The story is about the creation of a monster with the remains of the humans. The creation takes place in a laboratory. The main character, Victor Frankenstein, wished he would create a human being with the remains of other human beings. Finally, what he gave life to, was a monster. The monster would like to have a female because he was sad to be alone. But Victor didn’t manage to create her. It’s the reason why the monster decided to take his revenge and to kill a part of Victor’s family. 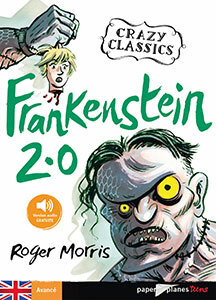 I liked reading Frankenstein 2.0 because the end is intelligent and there is suspense. I also loved reading it because I find that this story makes the readers think about the progress of science. Moreover I really enjoyed reading it because the intrigue is ingenious and the story is not too long. What I didn’t like is that it is complicated to understand and there are too many characters. I also didn’t like reading Frankenstein because it is too bloody. I wished the creature would be nicer. I wished Victor would take care of his monster because he left him alone. I thought the creature would find another idea to take his revenge. I’ve chosen this book because the front cover was strange. To the left, we can see a creature holding a dead head and in the bottom right-hand corner there is the creature. I loved reading Frankenstein 2.0 because I find it interesting and it’s a coherent story. I liked it because the main character is captivating and mysterious. He’s really gifted. To me, one negative point is the end. It’s disappointing : the characters die one after the other. We don’t know what the creature becomes after Victor’s death. I wished the characters would be more careful and the main character would take more time to get to know his creature. I thought Victor would be nicer with his creature and the creature would be less aggressive and bloodthirsty.